May 26, 2015 By Tina M 39 Comments This post may contain affiliate links. Read my disclosure policy here. This is a sponsored post written by me on behalf of Atlantic Luggage. All opinions are 100% mine. Ahhh. Is anyone else giddy about the summertime? I just got done packing for an upcoming trip, and I thought I would share some awesome packing tips. NOT ONLY THAT, but I’m also also doing a giveaway on the blog today for some awesome luggage AND telling you about how you can win a trip to Orlando for 4! It’s a good, good day people. I have been using Atlantic Luggage for over a year now and I really like it! Tonight while packing for an upcoming trip, I was able to get both of my kids packed into ONE suitcase, and it was their carryon! Atlantic Luggage has innovative features such as the Link2Go™ system, which allows you to connect multiple pieces of luggage for easy one handed rolling. Okay, now more info on the giveaway and sweepstakes so you can win something! Giveaway: To enter to win your own 3-piece set of Atlantic Ultra Lite 3 Luggage, comment below and tell me your favorite Packing tip, or your favorite place to travel. 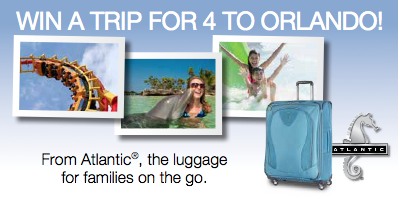 Win a family trip for four to Orlando, courtesy of Atlantic Luggage! Pack your socks inside your shoes. And bring snacks. roll shirts instead of folding them — you can fit so many more! My best packing tip is to roll clothes, especially children’s clothes, that way you can stuff items into small open spots left in the suitcase. Our favorite destination is Montana!! I roll as many things as I can! Helps fit more in! And packing outfits in sets is wonderfully helpful. Putting them in individual zip locks ensures that Dad can help out too! I agree with Kimberly. My favorite tip is putting outfits in separate bags. I hope I win! My husband and I pack in this dinky, far too, small luggage!! My favorite place to travel is Boston! My husband and I took our 10 month old daughter over to Abu Dhabi for 4 weeks and had a blast! What saved us on the long plane rides there and back was having her favorite blanket and a variety of brand new dollar store toys. They were new and interesting to keep her attention, but cheap for us and it didn’t matter if they got lost or broken on the journey. Roll, roll, roll! Rolling clothes instead of stacking them saves so much space! I’ve been using contact lens cars for cosmetics for my last few trips. This is by far the best! We love traveling to the Pacific Northwest! I have done the outfits in gallon ziploc bags before for little children and it works great! Also I like to pack a garbage sack for dirty laundry. I don’t really have anything that probably isn’t common knowledge- pack all your bottles with any type of liquids in big ziploc bags. Once you’re at your destination keep all your dirty clothes in a separate suitcase. But I love traveling to Disneyland! We use bags from the grocery store to keep our dirty clothes seperate. You can tie them off and stuff them in your suitcase. Here are several tried and true tips picked up from around the internet: When you roll up your clothes, use rubber bands to keep them rolled tight, put your camera into a plastic soap box to keep it from getting banged around in a soft sided suitcase or purse, put your earrings through the holes in a button to keep them organized and together, buy a box of cheap plastic shower caps and put them around your shoes as you pack. 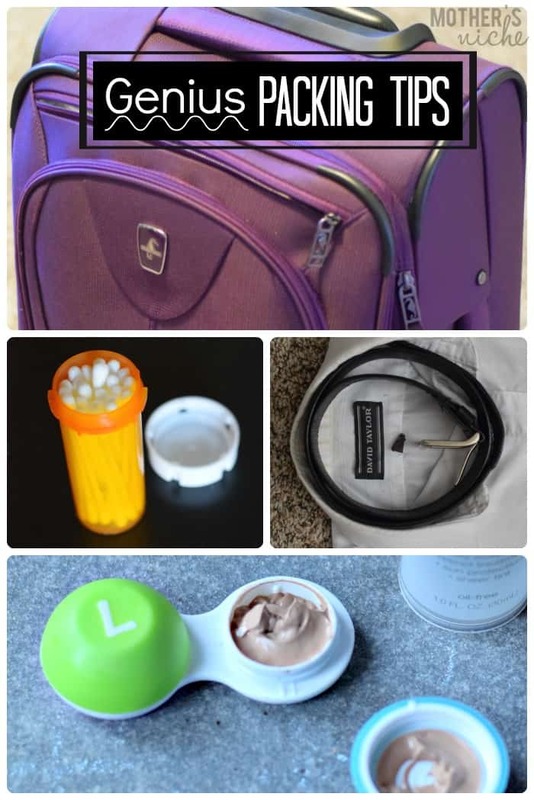 I also put my “liquids” baggie in an outer pocket to go through the TSA lines, that way it is easy to pull out for the scan and only takes a moment to pop back into the carry on. Be sure to check the airline’s web site about their luggage policy. If you can have a checked bag, pack an extra duffel bag in your suitcase to carry back your vacation goodies. Sometimes it is easier (and cheaper) to ship something home than pay the extra luggage fees. If you have enough clothes, ship your dirty laundry home and carry your souvenirs with you. My next planned vacation is D.C.
My favorite packing tip is to roll your clothes (that don’t mind wrinkles). They take up less room and are easy to find in your bag at a glance, rather than having to dig for all those different shirts/pants. I’ve always wanted to visit Ireland and have it on my *someday* list of places to go. rolling is the ticket! you can fit twice as much! The best packing tip is to place your shoes into a shower cap to save your clothes from bacteria and dirt, and fill the shoes with socks for extra storage space in your luggage bag. i love going to the beach and Disney World! The beach requires more packing- and then more relaxation , but Disney is SO much fun after you have all of your pre-planning done! My favorite place to travel to is the beach! It’s so relaxing & peaceful.. I also roll my clothes to save space, and save the diary laundry bags for future trips. My packing hack is using space bags! It really cuts down on the space you use and allows you to stuff more things into suitcases. One of my tricks is to pull out the drawer organizers and use them to keep my girl’s outfits and jammies separated in the suitcases. I roll each outfit together (socks, hair bows, and undies included) and then place them in the organizer. Makes my life sooooo much easier than keeping items in separate compartments. I just pull an outfit out and we are done. No fuss, no looking for that darn bow or that set of socks. 3- I collapse one of our laundry hampers and put it in the zipper part of the suitcase. Then I have a handy laundry hamper. When it’s full I can often finagle it into my suitcase without fuss about mixing dirties worth clean. I love the idea of storing makeup I’m contact lens cases! Brilliant! I’d really love to travel Scotland and Ireland one day, for now I have to settle for my cruise to Alaska this September. These are all great tips, I especially love the one to reinforce collars with belts. Belts inside shoes also help them from getting crushed. The Q-tip idea is new to me – will have to try that one! These are great tips. Using medicine bottles to hold Q-tips is pure genius! GIVEAWAY IS NOW CLOSED. THANK YOU EVERYONE! Best packing tip = roll clothes and then put them I’m gallon zip lock bags! You can vacuum out the air to make packing more so much easier! I love this because I always pack heavy ! I have packed my clothes in 2gal zip-loc bags since 9/11. That way there is no muss or fuss when the bags are inspected. Especially for my undergarments…don’t want dirty hands pawing thru my clothes…It works great for us.